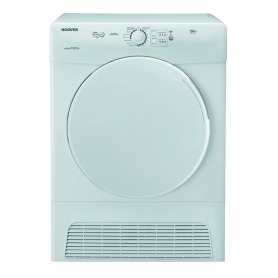 This condenser tumble dryer from Hoover will get all your damp laundry dried quickly and easily. 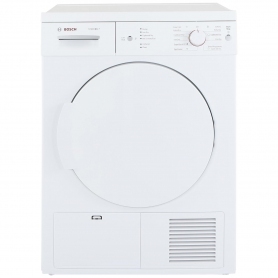 Featuring 12 drying programmes and a 9 kg capacity, the VTC590B is perfect for larger families. Condenser tumble dryers are convenient, as you typically have much greater freedom to place them wherever you want, compared with vented tumble dryers. Moisture is gathered in a reservoir that you periodically empty, so the appliance doesn’t need a vent to operate. Got a pile of damp clothes and not sure which cycle is best for you? Try one of the four sensor dry programmes. These will dry your clothes to the level of dryness you select, taking away the guesswork. Need to put on a load to dry but don’t want it to disturb your evening? Try the start delay function. This allows you delay the start of a programme by up to nine hours. Load up, set the delay for the duration of your choice and enjoy your evening in peace and quiet. The appliance can then run during the night when you won’t be disturbed. The VTC590B from Hoover is exclusive to Euronics and Agents stores, so you won’t find this fantastic tumble dryer anywhere else. Why not place your order now?